Welcome to the world of professionalism; we carry a lot of stuff and have nowhere to put it. We demand a multifaceted carry that looks cool, stylish and maintains functionality. We are better than briefcases. We need brands that understand our lifestyle: biking, driving, and walking. We are likeminded professionals, and our daily bags are representations of ourselves. From minimalist backpacks that redefine style and functionality to everyday carry backpacks that store everything we may need, scroll to find our favorite bags… we hope you find them as practical as we do. The Rains Backpack exemplifies simplistic Scandinavian design with a perfect balance of style and function. One of the best features of the standard Rains backpack is the inside laptop pocket, keeping your computer or tablet both secure and waterproof. Featuring one main compartment, this well constructed bag features a fold-over top with a single-hook closure. The double adjustable shoulder straps allow for comfort and ease of carrying for any length commute. Finally, a hidden pocket with waterproof zipper on the backside of the bag is perfect for easy access to your phone, or any other daily carry items. Keep up your professional style and stay ahead of the weather with a little help from Rains. Nomatic’s Travel Bag is carefully crafted to inspire confidence when your life is always on the move. With over 40 liters of storage and two innovative ways to carry, this travel duffel is the embodiment of versatility. You have the option to carry this everyday bag on your back or in your hand. 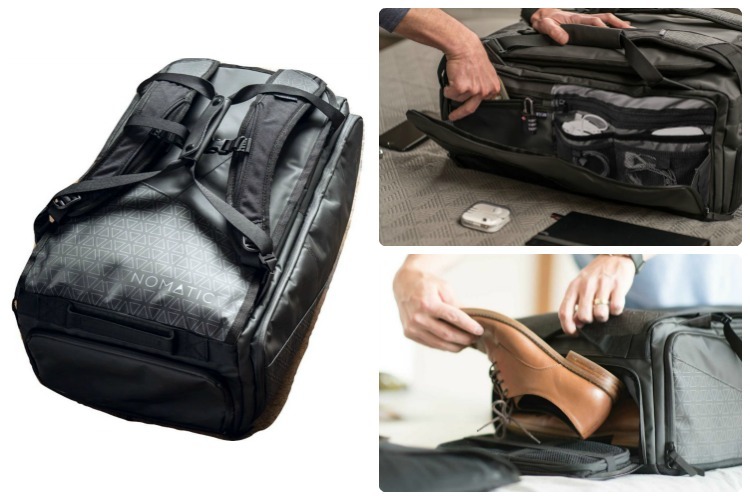 Loaded with over 20 features including a laundry bag, shoe compartment, underwear/sock pocket, padded laptop compartment, and an RFID safe pocket; the Nomatic Travel Bag is ready for anything that comes your way. Complete with a waterproof exterior, this duffle pack is perfect for daily use. The Crumpler Wip Daypack Backpack is a slimline pack crafted to keep up with the work and play of a modern lifestyle. Smart features like a 15 inch padded laptop sleeve, 7.6 liters of storage, and easy-access diagonal zipper make the minimalist backpack a perfect choice for students and urban commuters. Each Crumpler Wip Backpack is built with Eco-Tech polyester and a ballistic nylon blend to ensure that the exterior is abrasion resistant and weatherproof. Designed in France, the Cote et Ciel Large Isar Rucksack Backpack embodies their iconic style with flowing lines and unassuming functionality. Part sculpture, part backpack; the unique shape is an exercise in progressive design, stepping outside of the boring backpack box. Whether fashion or commute-worthy function are at the top of your priority list, the Isar doesn't disappoint. The weatherproof Eco Yarn exterior protects your gear, while an easy access front compartment with an interior pocket makes organization easy. Cinch it all down with the compression strap to reduce bulk for those crowded commutes. The best feature? A separate zippered padded laptop compartment in the rear for both security and easy access, with additional mesh pockets to organize your daily accessories. All in all, this versatile backpack will sets the bar in both style and function. No one combines the outdoors and the office like Topo Designs. Their Commuter Briefcase is the perfect combination of commuting convenience and office professionalism. It features stowable backpack straps, a detachable shoulder strap and two leather carry handles, providing three different options on how you carry your daily essentials. The subtle but extremely durable 1000D CORDURA® exterior guarantees a long life, while with a Horween leather base adds a beautiful touch of class and refinement. An internal sleeve fits most laptops or tablets, and best of all this Commuter Bag from Topo Designs is made right here in the USA. If you're the type of person that likes to pack for any and every possible scenario, the Copenhagen Backpack from Lexdray is your new best friend. With ample storage, organization, and access options, this EDC backpack is functional for every occasion. Inspired by American heritage aesthetics, the exterior is clean enough for a professional environment, and durable enough for world travel. Some of the highlights are weather resistant materials, military grade hardware, 10 zipper pockets and 4 snap pockets, a rear access zipper compartment, a fleece lined laptop or tablet compartment, and a breathable mesh back panel. Originating from Stockholm, Sweden, Sandqvist designed the Hege Backpack with a classic no nonsense aesthetic. Made with sustainably sourced cotton canvas and leather, this minimalist backpack is a commuter option professional enough for any workplace environment. The Hege features vegetable tanned leather, interior organization pockets, an interior laptop or tablet sleeve, side access zipper, and adjustable shoulder straps mounted on metal loops for flexible comfort for anyone. The quality materials give the Hege long lasting durability, and the simple design gives it timeless style. Goodbye fashion-focus, hello industrial design. The Invisible Backpack Two from Opposethis is a redesigned masterpiece of the Invisible Backpack One - a function over fashion-first inspired design. This multipurpose EDC backpack is completely weatherproof and has a fluid and well balanced look. Equipped with a shoe pocket, a 15 inch laptop compartment, and smaller hidden pockets for storage the Invisible 2 is versatile. Embrace functional design and choose the backpack that gets it done daily. If you're a photographer by profession or just always looking for that perfect shot, the Camps Bay Backpack by ONA is a game changer. Crafted by hand to deliver unassuming yet unwavering functionality in a meticulously designed fold-over package. The front-accessed, customizable interior padding allows you to hold a camera with a 70-200mm f/2.8 lens attached, and up to seven additional lenses, safely and securely. Or, segment your camera gear and personal gear differently depending on the lens size you need for the day. On top of that, you're equipped with space for a 17 inch laptop, customizable compartments, and a padded back and straps for comfort. All wrapped in premium waxed canvas and leather that will only get better with age. Available in Smoke, Field Tan, and Black. Made from recycled PET bottles, Pinqponq bags are founded with a sustainable purpose and focus on purpose-built design. The Large Cubik Backpack offers a super sleek, durable, and ultra-functional design. Crafted from 100% sustainable materials, it boasts a multitude of features to suit your everyday needs including a spacious 22L main compartment, a padded laptop sleeve fitting up to a 15 inch laptop, paper organizing sleeves, as well as a tablet sleeve. Don't sweat losing the small stuff either - they have their own place with smaller zip pockets, and a key ring. There are no shortage of useful features on this pack's exterior either. The Cubik Backpack has a standalone capability, a padded back panel for maximal comfort, and a separate compartment for all of your chargers. While simple in style, this backpack has the right mission at heart - sustainability and functionality. Based in Osaka, Japan, Harvest Label takes inspiration from military design and functionality, with a twist. The triangular shaped Tourer Backpack is contructed primarily from Tarpaulin, making it both lightweight and surprisingly durable. Leather accents add additional style points, while the unique shape makes it expandable adding versatility based on packing needs. Key features include a zippered front pocket, single side pocket, padded laptop or tablet sleeve, two interior pockets, and a padded mesh back panel. If you gravitate towards unique design and a minimalist daily carry load, consider going Ballistic.